Join Mishael for a weekly discussion of current events in Israel! This roundtable conversation will cover changing topics each and every week! This program will be held weekly at the Devil's Krafthouse at the Brodhead Center and snacks will be provided! Want to bring a headline to discuss? Have questions? 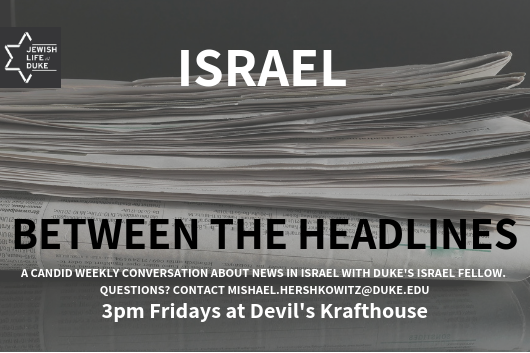 Contact Mishael (mishael.hershkowitz@duke.edu)!